Synopsis: My name is Chloe Saunders and my life will never be the same again. I’ve re-read Armstrong’s Darkest Powers trilogy more times than I can count — it’s THIS series that got me hooked on Armstrong as a writer (… she’s also Canadian too, which is super cool). Armstrong wrote this series as a way to provide suspenseful and supernatural reading materials for a younger audience that doesn’t contain as much adult content; this was after she discovered her daughter was reading her Otherworld series, which is not necessarily something you want your young teenager to gander through. So hang on to your hats as we begin this review! CONTENT & TRIGGER WARNING: This book contains bullying, mention of but not descriptive of murder, hospitalization, loss of a loved one, mentions previous loss of a parent, mental illness, pills (medical), and violence. Armstrong is a MASTER at providing the right amount of information at the right time. Overall, the story flows extremely well due to Armstrong’s knack for pacing and information load. Rather than DUMPING EVERYTHING in one chapter or one page, Armstrong guides readers through her story and provides snippets of what we should know at this point and hints at what’s to come. This does leave the story hanging with unanswered questions, but that’s what the SEQUEL is for — and all the books have been released so you don’t have to wait! There’s a perfect amount of suspense and eeriness, with a blend of some minor action and low-key mystery solving. Though some argue that this book has nothing going on, I beg to differ. Chloe, our main protagonist, goes through a lot of frightening events throughout her experience prior to and at Lyle House — both with the supernatural and with her run-ins with other “patients”. When she’s not scared out of her wits, she’s hunting down answers as stealthily as possible. Is it completely action-packed? No, it’s not. But it’s not meant to be. For a book written in the late 2000s, I’m pleasantly surprised to see the amount of diversity and “push against the norms” portrayed in the characters. So many book reviewers and other people in society have commented on the lack of diversity in novels today. That’s what really surprises me about this book — it was written over a decade ago and it HAS these elements. Not only this, but the characters aren’t all perfectly groomed and drop dead gorgeous — they LOOK like teens, pimples and all. Though our main character is Caucasian, there are other elements that add to the diversity — Simon is half Korean and half Swedish, Derek has some acne and other hormonal outcomes due to puberty and his changes, Rae has a copper skin tone and is shapely … just to name a few. It’s definitely refreshing. Chloe’s revelation and acceptance to the supernatural was well paced. Chloe doesn’t just AUTOMATICALLY believe in the supernatural, especially since she’s at a mental health rehabilitation house. As she begins to witness events that can’t be explained rationally and logistically, she begins to open up to the concept that this whole other world might actually be real. She never just gives in to what others tell her; she does her own research and gathers the facts before coming to a concrete conclusion. Reading through Chloe’s point of view is absolutely fantastic, as she’s COMPLETELY relatable and easy to enjoy. Chloe’s a movie buff, so she uses her producer and directing skills to help calm her down in scary situations — which is HILARIOUS! Though she’s overall kind and thoughtful, she has her flaws. She makes mistakes like we all do, such as judging someone on appearance rather than getting to know them and jumping to conclusions rather than asking — it’s fascinating to see someone who ISN’T a “saint” throughout the story. But my FAVOURITE part of her is her reaction to events … they’re so much more believable. For most of the novel, she’s utterly terrified with her encounters with the dead; she’s not just “automatically brave and heroic” … she’s scared out of her freakin’ mind! She does push towards finding courage, which is awesome. But her train of thought during these moments are spot on with … let’s be real, how we would ALL feel during these events. Though the moments are rare, there ARE some slower points to the novel. Though I hate to say it, there are a few moments that have a slight lull to them. It’s usually a part of a chapter or a chapter as a whole, but no longer. It’s the moments where Chloe’s adjusting to her circumstances or something’s about to happen — but the moments unfortunately still exist. Just know they don’t last very long. Chloe’s belief in her seeing ghosts was just slightly too quick. Her stance on the supernatural was well paced, especially with her having to decide what is real and what’s in her mind with the diagnosis she was given at Lyle House. However, a small part of me thought her belief in her seeing the dead was just a tiny bit too quick. The pro is that she’s constantly struggling between is it real or is it in her head, making her discoveries more believable. But I would’ve enjoyed her realization to come much later in the novel. Kelley Armstrong is one of my favourite authors of all-time; the greatest gift someone could give me is the chance to meet her, sit down and have a coffee and chat session. 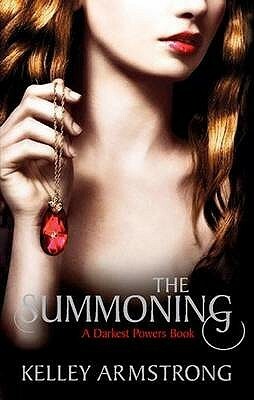 Re-reading The Summoning was such a fantastic experience, especially from a reviewers stance. Though there are a few elements that didn’t cater completely to my tastes, I wouldn’t change this book at all. Following Chloe’s adventures has been a thrill, and I can’t wait to continue this in the sequel — The Awakening. If you’re looking for a good supernatural story with lots of interesting characters, you should give Armstrong’s The Summoning a chance! Let me know if you do!! They’re wonderful! Even if it’s a bit slow, it sounds like it was super well done. I’m definitely intrigued by this! Awesome review! It’s so good … I love Armstrong ha-ha!! Oo! I hope you give it a shot AND enjoy it 🙂 Thank you very much!